By John Yunker. Ashland Creek Press. February 2019. 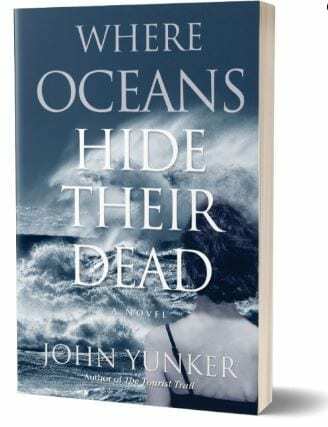 Where Oceans Hide Their Dead is the long-awaited sequel to The Tourist Trail. Robert Porter has quit the FBI in search of his long-lost (and presumed dead) love, Noa, only to find himself on the wind-raked shores of Southern Africa working for a seal-rescue organization. When a confrontation with local sealers ends in murder, Robert must abandon the seals and his search to join a private intelligence firm seeking to locate an activist who stole files from one of the world’s largest biotech companies. On the other side of the planet, Tracy Morris is an Iowa City hospice nurse by day, while by night she obsessively follows, and ultimately loses, Neil Cameron Jr., whom she sent to prison back when she was a brokenhearted drug addict. Meanwhile, in New Zealand, Amy Bakas, an American backpacker unsure about her impending marriage in the States, joins an attractive and mysterious man hitchhiking to the South Island. Along the way, she discovers that he is Neil Cameron, and that he is on the run for his life. The stories of Robert, Amy, and Tracy collide on a desolate beach of Australia in this passionate, adventurous novel about living on the edge of society and love in all its myriad forms.